As I read that there was a Roman road which was among the finest examples of Roman road-building in Britain preserved at Wheeldale Moor, I went to see it. Wheeldale Moor was covered with heather as far as I could see. And a line of scattered large stones continued there, scraping the carpet of heather. That was the Roman road. But the road was wasted far beyond my imagination. I had expected to see a well paved road like the Appian Way in Italy. The notice board of the Ministry of Public Building and Works said that this road "connected the Roaman fort at Malton", 17 miles to the northeast of York, "with the coast near Whitby and was probably used in late Roman times as a link with the signal station on that coast". The board also said that "the large stones visible now formed the raised central foundation and were originally covered by a fine road surface, probably of gravel". The book Iread said that the Roman roads were usually made with a bottom layer of large stones embedded in sand and covered with rammed gravel to a thikness of about 18 inches, and the surface was paved with local materials. Wandering along the rugged road, I found some parts where round flat stones spread like paving stones. The corners of those stones were worn quiteround by weathering for more than fifteen hundred years. 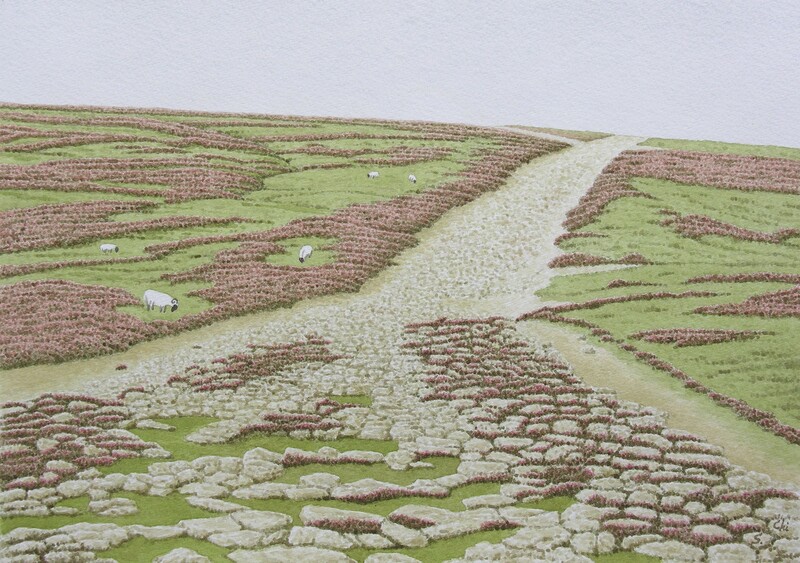 Although the heather of both sides of the road was removed to a width of a few dozens feet, it entered into the road and flowered in the openings between the stones. And the light pink small flowers were trembling in the cold wind. Heather in bloom looked like a piece of lace which the moor wove up to tell the glorious days of the Roman Empire. Whenever the the Roman fort received the news of barbarians' raid, the Roman troops, led by the Aquila, a standard of Roman eagle, would march along the Roman roads bravely, flying their red capes. It is said that the Romans built more than 6000 miles of road network in Britain during first 40 years after Emperor Claudius had conqured Britain in AD 43. It is difficult to believe that the Romans, who were born and grew up in the Mediterranean, created this vast system of roads. The weather of Britain is very cool and changeable. Even when it is sunny, there are occasional sudden showers. It is cold and gloomy when rain falls in the moorlands in cold seasons. But the Romans built extensive roads in this northern country. I am just amazed at their strong wills. Looking at the motoring atlas of the Ordnance Survey, I noticed that the roads of England , most of them built by the Anglo-Saxons, were quite often winding. Among them, some roads have sections which run very straight for several or dozens miles. Such sections are said to have been the Roman road. The road, which has been called Ermine Street, runs northwards from Lincoln to the River Humber. It is straight for 30 miles as if it were drawn using a ruler. For the strict Romans, the road must be as straight as possible and it was reasonable for military roads to move the troops fast. But the Roman roads were not convenient for the Anglo-Saxons, later inhabitants of this isle, and they were tolerant enough to bend or curve the roads whenever they need to do so. Consequently, I suppose, the roads of the British Isle became winding as the case might be. The Roman roads of England had fallen out of use and been abandoned in the Anglo-Saxons age. They would take away stones to build their houses. In England there is another Roman road remaining paving. It is a Roman road of Blackstone Edge, moorland about 14 miles to the northeast of Manchester. The paving seems to be usable even now, but there are arguments: the paving was repaired before the Industrial Revolution, so it is not the Roman origin. Since Roman coins have been discovered near it, it is thought that a Roman road had once run here.